I have always loved making sugar cookies and making fun shapes with either a cookie cutter or a knife. I love making hearts and stars and clouds. They are so fun and cute! It made me wish I could show everyone my masterpieces. I am going to show you have to make fun shapes to place in your soap. Even if you prefer to use cookie cutters, you will have everyone praising you, because using cookie cutters is not bad, or even cheating. Consider yourself an artist. You are! Some artists use darts and balloons, while others use paintbrushes. Line your baking sheet or mold with parchment, waxed paper, or a silicon spray for easy removal. Melt the soap designated for your cutouts. Color and scent as desired. Remember, do not use a dye as it will bleed through your finished bar of soap. In this example, I used the fragrance Cinnamon Bear and the pigment Lavender Fields. Pour the soap on your baking sheet and allow to cool. Pour in enough soap to create the thickness you want your cutouts to be. Once cool and firm, you can use miniature cookie cutters, a knife, or a toothpick to create and cutout your designs. It is recommended that you cut your designs when your soap is firm. 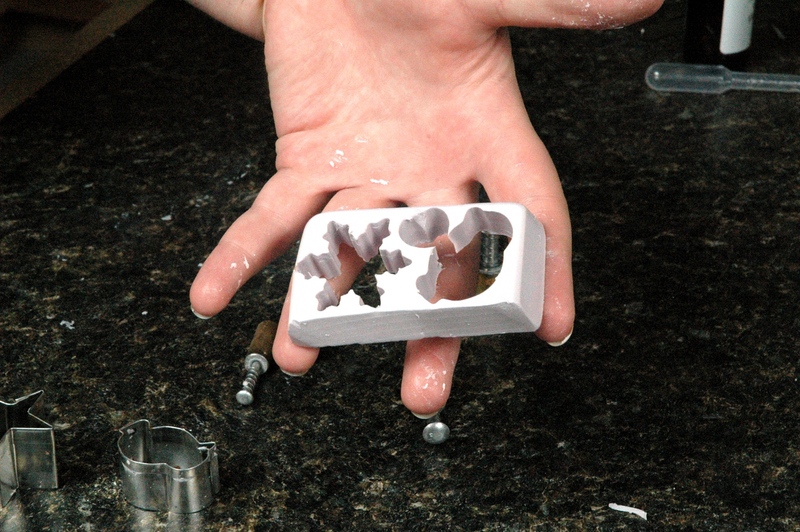 If your soap cutouts are extremely thin, they will curl. Should you desire that effect, pour your soap so you have a small thin sheet. If you do not want it to curl, pour your soap sheet so it is thicker. 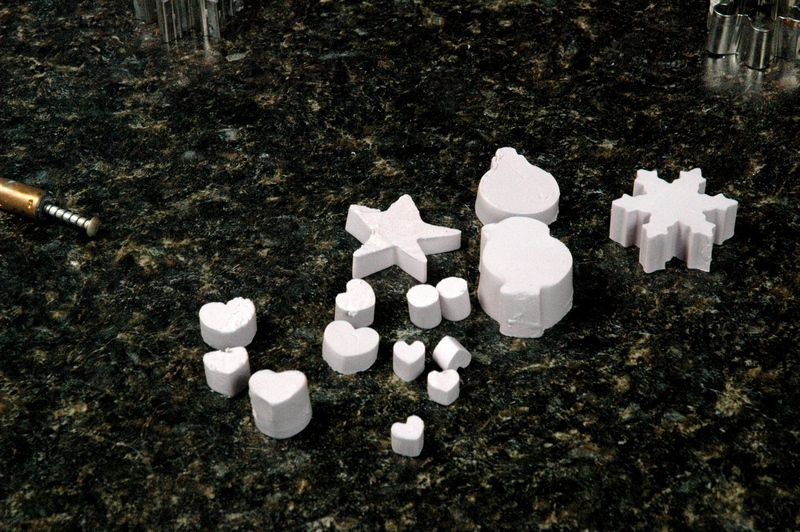 If you don’t want the trouble of trying to keep to two cookie cutter sets separate, you can trace your design on paper or directly on the surface of your soap with a knife or toothpick. Then you can cut it out. TADA! Now you are already to put your cutouts in a bar of soap. Don’t miss the blog tomorrow for how to place curls and cutouts in soap. 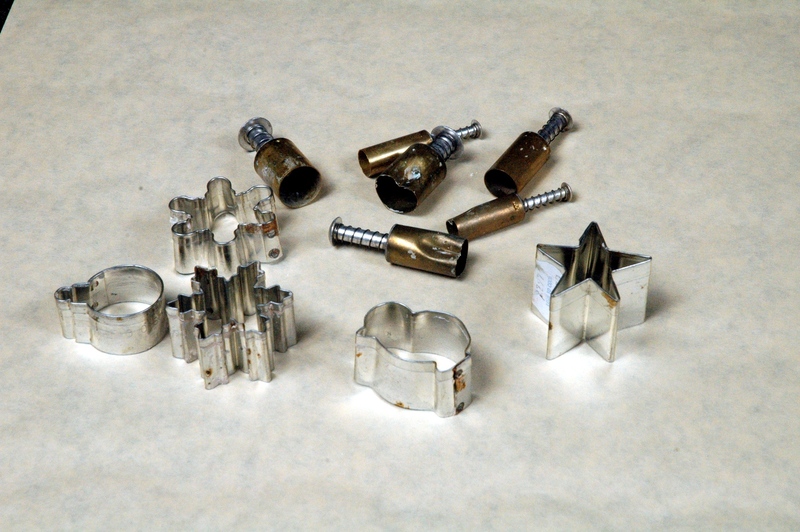 A small collection of cookie cutters. Different shapes I have made. Extra soap that can be melted again.